Wondering why chatbots are gaining popularity? Interested in how savvy businesses are using bots to improve communications with their customers? In this article, you’ll discover insights from research that show how bots are evolving and affecting customer service experiences across many industries. 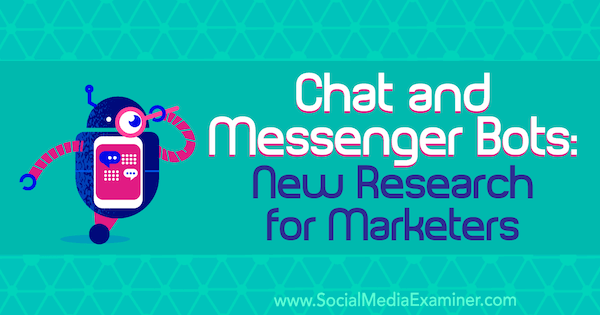 Chat and Messenger Bots: New Research for Marketers by Lisa Clark on Social Media Examiner. Many companies in a variety of industries are learning firsthand how bot technology can change the way they provide customer service. This technology is being used to assist with personal online banking, booking travel accommodations, managing insurance claims, offering internal support, answering customer service requests, and even providing better mental health access. Bots are artificial intelligence systems that interact with users via messaging, text, or speech. They’re being used on websites, as well as on platforms like Facebook Messenger, WhatsApp, Slack, WeChat, and more. They allow businesses to move communication with their customers or potential customers forward without human participation. Your brand can essentially be present 24/7. That said, a bot is only as good as its programming and user input allow it to be. Additionally, bots require training. Complete automation or AI replacement for customer service isn’t feasible at this time. However, we’ve made leaps and bounds in just a very short time. The technology is now becoming advanced enough that bots can be used in a meaningful way, and this is expected to continue to grow. An early adopter that makes use of chatbot technology is 1-800-Flowers, which was one of the first to use Facebook Messenger bots. Customers can get help with flower selections and receive instant updates on delivery timing. 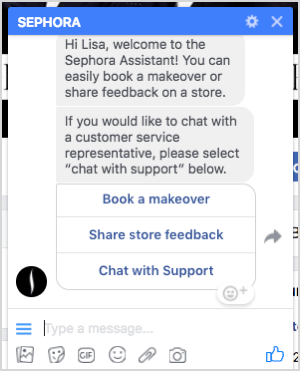 Sephora has found a unique way to reach their target audience through chatbot technology. Their Color Match bot for Messenger helps customers find an exact match in lipstick shade by using a photo they’ve uploaded. The company also has the Sephora Virtual Artist app that allows you to upload a photo of yourself and then try on different makeup to see how it will look on you. In the insurance sector, Allstate has an AI virtual assistant called Allstate Business Insurance expert (or ABIe) that helps answer questions from customers directly. Then there’s the popular Woebot app, used primarily through Facebook Messenger, which brings therapy right to the palm of your hand. This AI robot is trained in cognitive-behavioral therapy (CBT) and helps track the user’s mood, find patterns in mood swings, and talks about health and wellness in daily chats. It even checks in on the user daily. Businesses are using bot technology to change how they communicate with their customers. Oracle reports that 80% of businesses want chatbots by 2020, and many of those respondents were already using them. 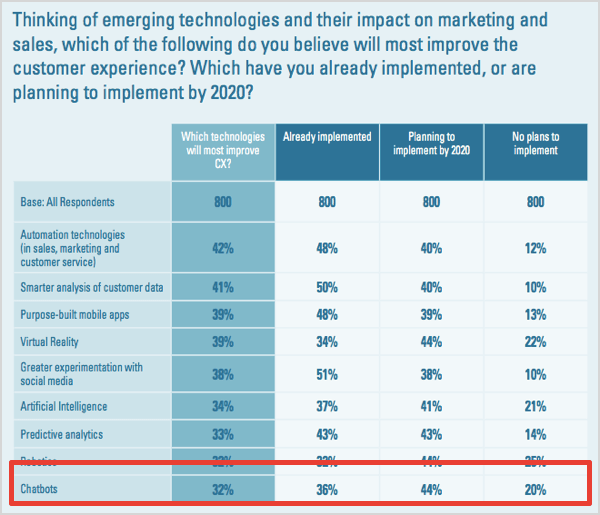 The survey included responses from 800 business decision-makers, including chief marketing officers, chief strategy officers, senior marketers, and senior sales executives from France, the Netherlands, South Africa, and the UK. To stay ahead of the curve, it’s a good idea to get comfortable with bot technology now. Mobile messaging apps like WhatsApp and Facebook Messenger are huge business. People want to be able to log in from wherever they are and chat with friends, family, and even brands they do business with. Mobile messaging apps are about more than just sending messages. The industry has evolved and with falling data prices, improved features, and cheaper prices for mobile devices, the apps are available to a larger base of users than ever before. Tech-savvy brands are building on the popularity of messaging apps and bot technology by focusing on growth now, and then in the next phase on building services and monetizing. While the stats show that marketers and media companies are still focusing on and putting more resources into social networks than messaging apps, this is expected to change between now and 2020. We could see a big shift in the online marketing world as media companies and marketing experts move from social networks to messaging apps and bot technology instead. As technology changes and brands fight to “go where the customer is,” we’ll see more of this. Messaging platforms will continue to grow and we’ll see more brands taking advantage of bots to connect with their target market using these apps. What’s next for chatbots? Technology around the chatbot industry is growing at a rapid rate. Bots are learning to do more things; spot patterns better; and trigger accurate responses based on keywords, phrases, or other stimuli. According to a recent report by Grand View Research, the global chatbot market is expected to reach $1.23 billion by 2025. Trends that we’ll likely see in 2018 and beyond include more advances in AI development. 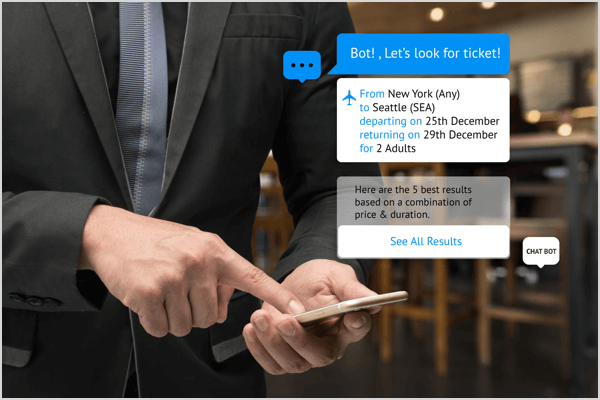 Smarter AI means more accurate chatbot experiences. Voice interfaces like Amazon’s Alexa are gaining traction with users, and Google is working to make voice interfaces interactive with wearable devices and smartphones. We’re also seeing advances in conversational interfaces; companies like Drift and iAdvize are leading the pack in this area. Have you landed on a website and seen a chatbox pop up (usually in the lower right) asking you questions? Expect to see more of this. Many businesses are already using bot technology for things like marketing, sales, and customer service. As we can see from the stats, the chatbot industry is only going to continue to grow, and 2018 is likely a launchpad year for the future of the bot industry. We will eventually see chatbots completely replace native apps and that transition will make some huge leaps in 2018. No longer will users have to go from a site to an application and back again. The flow will be seamless, based on the user’s needs and preferences. The stats show us that bots are here to stay, at least in the foreseeable future. The technology is growing at a rapid rate, bots are becoming cheaper and easier to use, and more businesses and brands are hopping on board. Juniper Research tells us the average time saved per chatbot in the banking and healthcare sectors, when compared to traditional call centers, is 4+ minutes. Think of the money businesses will save from this! The average cost saved per chatbot interaction in banking is $0.70. What do you think? Do you enjoy interacting with chatbots? Would you use one yourself for your business? Share your thoughts with us in the comments. Lisa writes copy with soul for coaches and heart-centered entrepreneurs.